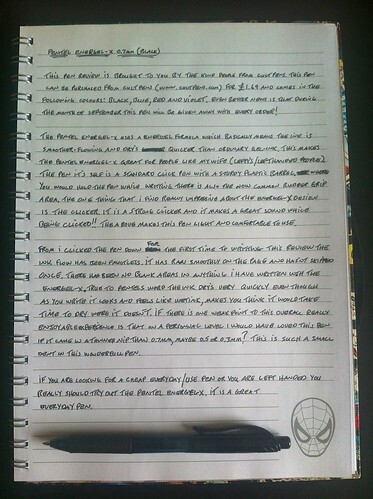 This pen review is brought to you by the wonderful and kind people from Cult-Pens. This pen can be purchased from Cult-Pens for £1.69 and comes in the following colours - Black, Blue, Red and Violet. The Pentel Energel uses a unique Energel formula which means that the ink is smoother flowing and drys quicker that a standard gel ink pen. This makes the Pentel Energel-X great for people like my wife (Left handed/Leftys). The pen itself is a standard click pen with a sturdy plastic barrel. Where you would hold the pen while writing there is a common but needed rubber grip area. This means the pen is comfortable to hold and sturdy enough for everyday use. The one thing that immediately stood out to me when I started using this pen was the clicking mechanism. It is a sturdy clicker that makes a great sound when you click it down to either start writing or retracting the pen nib. From the first day that I started writing with the Pentel Energel-X to when I was writing the notes for this review, the ink flow has been faultless. It has run smoothly on the page and hasn’t skipped once. There hasn’t been any blank areas in my hand writing and true to Pentel’s word, the ink has dried very quickly even though as you are writing the ink lays down on the page with a wet look. If there is one weak point to this overall enjoyable experience is that on a personal level I would have loved the nip of this pen to be a touch thinner, maybe a 0.5mm. This is a small dent in a wonderful pen though. If you are looking for a cheap everyday pen or you are left handed you really should try the Pentel Energel-X.